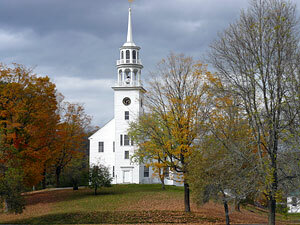 The Universalist Society of Strafford, founded in 1798, is the second oldest in Vermont and fourth oldest in the nation. In the early years, Universalists met in Strafford’s Town House (left). They shared the building with other Protestant denominations. Eventually the Universalists, Baptists, and Congregationalists all built their own churches. 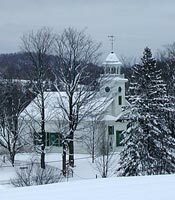 Our “new” Universalist Church was completed in 1833, in the village of South Strafford, about two miles south of the Town House. 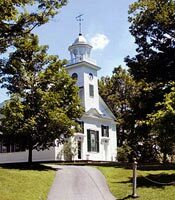 In the first half of the 20th century, the Universalist Church in South Strafford was led by the Rev. Harry Fay Fister, and then by Rev. Weston Cate and various visiting ministers. For most of the 20th century, until 1980, services were held only in summer. Then, in 1980, the Church became inactive and the parsonage was sold. During the years when the Society was inactive, Liz Harrington and later her niece Jane Phelps worked hard to keep the building and grounds in good repair and ready for rebirth. In May of 2002, after 22 years of inactivity, that rebirth occurred. A group of 20 people joined the Church and revitalized it as a place of worship for liberal thinkers in Strafford. The Church became affiliated with the Unitarian Universalist Association. At first, services were lay-led with guest speakers and ministers on the lst and 3rd Sundays of every month. For the first time in many decades, the Church is now active year ‘round. During the warmer months services are held in the historic church building. When it gets too cold, services move just across the street to Barrett Memorial Hall. 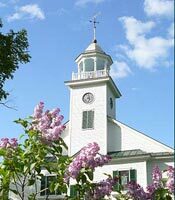 In 2008 the Univeralist Society of Strafford had the pleasure of conducting a service of Ordination of Dr. Kennedy into the Universalist Ministry. The service was conducted before a full house of worshippers and ministers from churches throughout our area and representatives from the Unitarian Universalist Association. Our current minister is Rev. Telos Whitfield. While the congregation is still small, it is active and slowly growing. Activities the congregation regularly participates in include the Unitarian Universalist Service Committee annual “Guest at your Table” fundraiser for local and international outreach and care, the Water Communion, the Flower Communion, and the Solstice Bonfire. Several seasonal activities are also conducted with other area churches.